It’s as if Christos Gage is working from some master plan with how Buffy’s story continues to unfold. For those of you just arriving, we have a sweet spot to jump in. In this new arc, “Love Dares You,” we find Buffy navigating through the rituals of being single and sort of carefree. She even indulges in a round of speed dating. She can’t help but attract the more edgy sort, or poseur edgy. It’s a funny opening scene that sets the tone for much to follow. I’m loving the artwork by Megan Levens, with colors by Dan Jackson. It’s a uniquely cartoony look with an aggressive punch to it. Buffy is down there in the trenches trying to figure out life. In the current configuration, you have Xander and Spike sharing an apartment. And you have Buffy, Willow, and Dawn sharing an apartment. And then there’s Giles. Only a season ago, who would have ever thought we’d have Giles back as a walking and talking character. Of course, Giles is not exactly where he’d like to be in human form. But you can’t have everything. And, to top it off, you have Buffy and Spike working together again. You have a lot of room to move around with action and characters, perhaps more than ever before. And bubbling in the background is a world …on the verge of magic. That’s got Willow working overtime figuring out the new rules. If all of this sounds rather involved for new readers, it’s really a very good place to be. You may want to do some binge reading and pick up one or more trade paperbacks collecting previous issues. But, if you’ve been looking for a nice jump into single issues, this is a very good one. 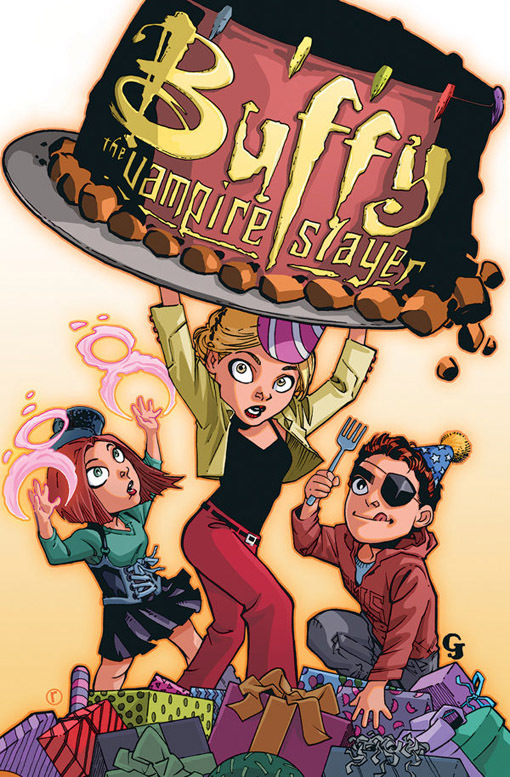 “Buffy The Vampire Slayer Season 10 #11” is available as of January 21. This is Buffy on a very good track. Pick up your copy today. Visit our friends at Dark Horse Comics right here. The artwork is really nice. She sounds like a contemporary character we can relate to. Did you decide to go with .org or stay as is for now? I think you’d enjoy Buffy. Can’t say I’m not happy where I am now with .com. We’ll see how things go. Thank you, Klaus. Wish you well too! You can download online versions from Dark Horse comics app in the app or android store the day they are published.